This week’s notable number is 30 — the number worn by sophomore running back Toneil Carter and defensive back Mason Ramirez, a Round Rock native who has now walked on at both Texas and Kansas. Texas’ longest run this year is Daniel Young’s 30-yarder against Tulsa on Sept. 8. Kris Stockton attempted a school-record 30 field goals in 1999, though he made only 20 of them. The number 30 also represents the number of times that UT has held an opponent to a negative rushing total. Texas did it again in last week’s 37-14 win over USC. The Longhorns held the Trojans to minus-5 rushing yards, the 24th-best performance in school history. Leading the charge was senior linebacker Gary Johnson, who was later named the Big 12’s defensive player of the week. Three of USC’s 16 rushing attempts were sacks. A key fourth-and-goal stop by safety Brandon Jones also was one of seven tackles for loss. USC had rushed for 333 yards over its first two games, and the Trojans even registered a 23-yard touchdown on their first drive. “Anytime that you look up and you have negative five yards rushing, that’s not very good,” said USC coach Clay Helton. There have been 26 times that Texas has held a team to negative rushing yards and then followed that up with a game in the same season. The Longhorns have never pulled off a back-to-back negative-negative. Texas has gotten close, though — holding Texas Tech to minus-17 yards and then Colorado to 3 in 2004; holding Rice to minus-12 yards and then Iowa State to 21 in 2006; and holding the Red Raiders to minus-6 yards and then UTEP to 9 in 2009. On the opposite end of the spectrum, one week after Texas held TCU to minus-43 yards in 1980, Baylor piled up 302 rushing yards on the Longhorns. Texas lost that one 16-0. 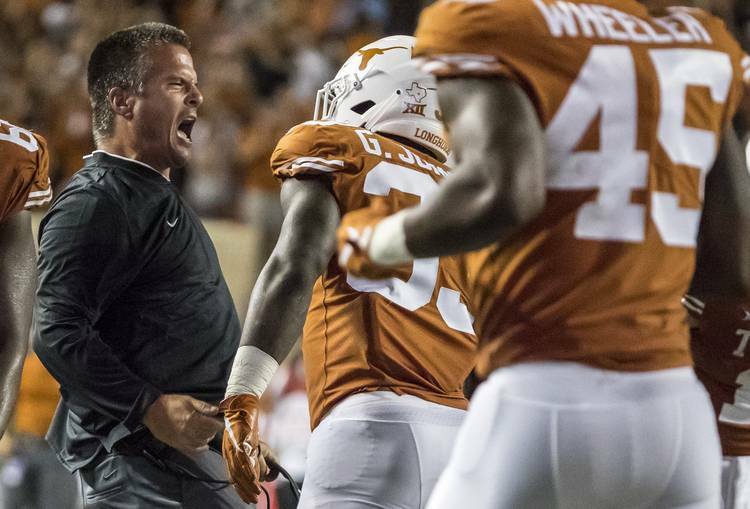 In those 26 same-season encore games, Texas has allowed an average of 108.2 rushing yards. Fourteen of those 26 opponents were held below 100 yards. Texas’ next test will come Saturday against a TCU team that boasts the country’s 32nd-ranked rushing attack. The Horned Frogs have rushed for 677 yards; last week Darius Anderson broke LaDainian Tomlinson’s school record with a 93-yard run against Ohio State. Last year, Anderson accounted for 99 of TCU’s 177 yards in a 24-7 win over Texas. UT also must contend with sophomore Shawn Robinson, who was rated as the sixth-best dual-threat quarterback in the 2017 recruiting class. He has averaged 6.6 yards per carry over TCU’s three games. Last year, Texas ranked No. 8 nationally against the run, allowing 106.8 yards per game in defensive coordinator Todd Orlando’s first season. Texas is close to that mark so far in 2018, allowing 109 yards per game, which ranks 28th. TCU averaged 5.6 yards per carry against Ohio State. Omenihu and Nelson both said this week that getting to rush the quarterback was the reward for stopping the run. Omenihu said the key against TCU will be to get off the blocks and be physical at the point of attack. “It’s really as simple as you make it right there,” he said.